The time for more detached scholarly research on the interstate conflict over responding to the Syrian civil war, and war crimes therein, will come later. Clearly the 21 August chemical weapon attacks intensified this conflict greatly. The affective geopolitical complex discussed by Sean Carter and Derek McCormack (Ch 5 of Observant States) organized around intensity, amplification and resonance of images is analytically useful as a point of departure for making sense of what is unfolding. The current drama, after all, is one where horrific videos, and photos (front page FT 22 August 2013 above) are central. While critical geopolitics is a scholarly enterprise, its practitioners live in a world as citizens, intellectuals and activists. We cannot avoid politics and we should not avoid the troubling questions of our time, even at the risk of getting things wrong. There are, I would argue, a number of inconvenient truths that we need to face when thinking about Syria. I describe them as such because human cognition processes tend to lead us to convenient truths that, more often than not, support preconceptions, social biases and outcomes colored by wishful thinking. I also describe them thus because they paint a grim picture of where we are. Here’s my list which is really an attempt to reason out my position. 1. Syria is the location of the largest instance of preventable mass human suffering from direct violence in the world today. 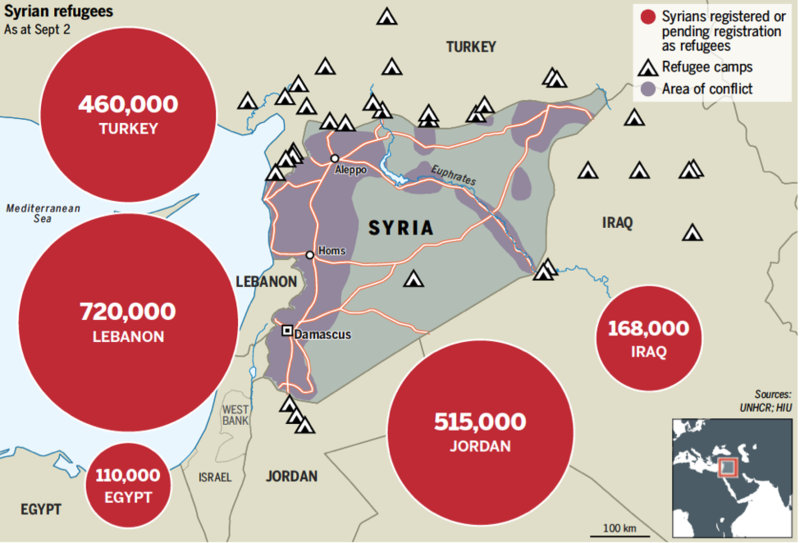 Syria is analogous to Afghanistan in the 1980s as David Miliband argued recently in the FT (graphic is theirs). The country is the most egregious instance of mass human suffering facing the international community today. That there are other significant sites of human suffering — eastern Congo, Afghanistan, Pakistan, sectarian riots in Burma, ongoing repressions elsewhere — and other things to be deeply concerned as citizens about — unaccountable spying agencies, drone assassinations, occupations, guns, racism, homophobia — but these should not diminish or detract from this. They’re all important and serious international work should be done on each. But Syria’s agony is in the spotlight now for a very good reason. 2. The structures of interstate response to the Syrian crisis are broken. UN Ambassador’s Power’s remark that the Syrian people do not have the UN Security Council they need is unfortunately true. Due to the endurance of World War II rules, the international legality and legitimacy of military intervention by a coalition of concerned states against immediate mass human suffering is determined by two states who have, lets say, ‘challenged’ human rights records. The US needs to have strong working diplomatic relations with both states to advance common security objectives. But it should be obvious that the current condition where the imprimatur of ‘international law’ and ‘legitimacy’ can be decided by one or two states is a dysfunctional one. Those who evoke ‘legality’ and ‘legitimacy’ as necessary criteria for intervention in Syria are not seriously engaging the issues. 3. The use of US-led military force against the Assad regime is probably the most effective way to break the stalemate of the Syrian civil war. This is a huge inconvenient truth to all concerned in multiple ways. The war is a hurting stalemate, with the capacity to get much worse, though with no sign that the ‘hurting’ is inducing the possibility of dialogue. Inconvenience number one is that Obama and his advisers have proven themselves to be cautious realists about this conflict. Dempsey and Hagel probably remain serious skeptics of war as a means to that end, Obama possibly too. Who wins the Syrian civil war, Obama probably calculated, is not necessarily a vital US national security interest, though there clearly were significant internal administration tensions over this. Yet Obama’s ‘red line’ and the scale of the chemical weapons attack forced the issue into one of international norms and US credibility. Obama was forced out of his cautious realist comfort zone. Will punitive strikes that destroy the regime’s capacity to make war, and/or render it leaderless, be the most effective means to end the Syrian war? This is a hugely debatable issue — Juan Cole argues it will prolong the war — but the ostensible US goal is not regime change but behavior modification. There is deliberate ambivalence about this though as the administration seeks to build a coalition of support that includes ‘limited strike’ supporters with ‘regime change’ hawks. There are good arguments for why any military strikes requires a broad military authorization. It can be argued that Obama’s deterrence objectives are already working: the regime has not used chemical weapons since August 21st (I am assuming that it was the regime that used them but will await full empirical data on that). What is the US objective? If deterrence, it is already being achieved. But it can be argued that the chemical weapons argument is a vehicle for a broader more ambitious strategy of regime change. Further, it can be argued that only regime change will achieve the chemical weapons dismantling that the US, Israel and other states urgently want. Another inconvenient ‘Pottery Barn’ truth: if the US breaks the regime, it owns the resultant fallout which may be particularly nasty indeed. 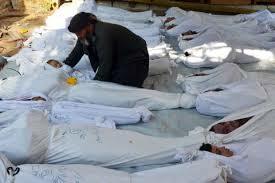 The prospect of revenge ethnic cleansing against Syria’s Christians and Alawite population settlements is very real. One can argue that from a human security point of view the best scenario is probably where US-led airpower creates an opportunity for the opposition to strengthen their position on the ground and forces either the Assad regime to fracture or to come to the negotiating table. But this may not happen if the attacks are not sustained and effective. This inconvenient truth is more killing in the short term (for a consideration of the just war issues see this), including young soldiers socialized to know little beyond the structures they found themselves within. But without US-led force, there will be killing anyway, and maybe for a long period. Deep pessimism about military force as a ‘solution’ to the Syrian crisis is fully justified. But outside punitive strikes as a means to catalyzing a political solution is something that might work. Yes, its “bombing for peace,” and its grim and ugly. Is it better to let this drag out for years, with millions displaced all this time? 4. The United States is hobbled by serious legitimacy crises on multiple fronts. As should be evident from Obama’s difficulties in rallying allied leaders, and public opinion within the United States (and evidently in the House), the prospect of the US using military force in the Middle East again has little legitimacy. Call it Bush’s revenge, the poisoned legacy of Iraq, and the drone/NSA blowback, Obama is feeling it. The inconvenient truth here is that this hurts the prospects for ending the Syrian conflict any time soon. The debate over Syria in the US Congress has been a positive deliberative challenge for that institution and the US political system. Its a deeply consequential moment with the US’s position in the world, in symbolic terms at least, at stake. An inconvenient truth to those who call themselves ‘realists’ is that US use of force in Syria against Assad is in the US national interest because US national interests are inextricably bound up with international security norms, especially those concerning the proliferation of BNC weapons. Global risk society demands common security norms, practices and conventions. Risk society realists cannot be insular (Mr Walt). The conflict also involves an important NATO ally in Turkey as well as important regional allies like Jordan and Israel. The US, hobbled as it is, is still considered the ‘indispensable nation’ for these states in leading a response to the crisis they deal with daily at their borders. 5. This doesn’t end soon. Afghanistan has been, to borrow a euphemism of the moment, a ‘degraded’ state for the last 30 years, ever since the Soviet invasion. Syria could on track to becoming the same, and spreading out to engulf the already fragile Lebanon and Iraq. Israel-Iran tensions are entering a new phase with more pragmatic leadership in Teheran but could be swamped by this. Managing Syria, hopefully through post-conflict reconstruction not containment, is likely to be a decade long project at least. So, a concluding inconvenient truth: moral courage is required by Obama to do both a politically unpopular and deeply uncertain thing: use US military force against Assad in Syria. The most inconvenient truth of all: he may fail. This entry was posted in Congress, Current affairs, George Bush, Israel, Middle East, Obama, Political Borders, Political Geography, Presidency, Russia, Syria, US Senate, war crimes, Washington D.C., World political map. Bookmark the permalink. If this was in fact a “hurting stalemate” then it would be open to mediation with a reasonable chance of success. It is by no means clear that this point has been reached. I won’t suggest that I know as you do what the truths about Syria are but I get the impression that for some time the key decision for policy has been whether to try to achieve a reduction –if not the cessation of violence –or to actively try and change the regime. Achieving peace in Syria has surely never been the goal of US foreign policy unless it was accompanied by regime change. For me, a frozen conflict has long been the most desirable scenario–achieving that is enormously difficult. I am not sure what dynamic that you see according to which the use of military force leads to a negotiated transition of power.